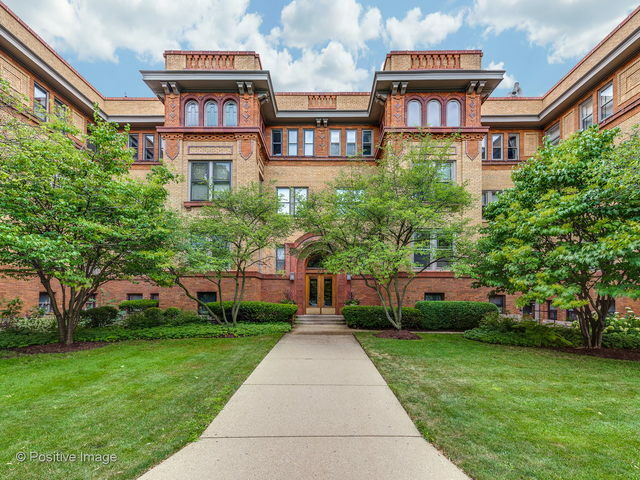 Beautiful vintage apartment in the highly desired Shakespeare building overlooking Lincoln Park. Sunny, south-facing living room w/built-ins & a fireplace. An adjacent room currently functions as the perfect den or family room, but could also serve as formal dining. The updated kitchen has granite countertops, great cabinet space, & a lovely butler's pantry with laundry. Master bedroom has an updated vintage-like bath, walk-in closet, & access to the beautiful sun room for the perfect retreat. Three additional bedrooms & an additional hall bath. Premiere location near the zoo & private schools, plus Lincoln School! One car parking & finished basement space for play area or storage. Amazing courtyard building with fabulous common outdoor space and an onsite engineer. Directions LPW BETWEEN WEBSTER AND BELDEN. ENTRANCE TO UNIT IS ON SIDE AT THE SOUTH END OF BUILDING. Property information last modified by seller on Thursday, April 11, 2019, 12:05 AM CDT. Information Deemed Reliable But Not Guaranteed. Unauthorized duplication, use, or linkage is prohibited. The information on this web site is for personal, non-commercial use and may not be used for any purpose other than to identify prospective properties consumers may be interested in purchasing. Monthly Payment Calculator results are for illustrative purposes only, not a financing opportunity; calculations assume a 30-year fixed-rate mortgage and do not include closing and other costs. Property Tax on NEW properties is estimated at 1.5% of Listing Price for payment calculation purposes; actual value may be higher or lower.